Data used in textbook are available in this spreadsheet. Journal of Agribusiness book review is available in this pdf file. Despite our best attempt to produce a perfect textbook free of errors, as with most textbooks in their first edition, there are some errors. Below are the errors that have been found thus far and links where users may download corrected verions of the text and figures. If you find any errors that are not listed below, please email them to Bailey Norwood at bailey.norwood@okstate.edu. Page 22 should say, this is a parity price, a price in one time period that provides the same purchasing power as the price in another time period. In the section Study Questions on page 94, question 4, beef, pork, poultry, and fish should be substitutes, yet the cross-price elasticities in the question are negative, when they should be positive. As the price of beef rises, that should cause the quantity demanded of pork to rise, which would only happen with a positive cross-price elasticity. These are real, estimated elasticities, as given by the citation in the question, but probably just not estimated well for a variety of reasons. So I would just tell students to change the negative to a positive sign. On page 94 question 7, it should say "cross-price elasticity of beef demand with respect to pork prices", not "cross-price elasticity of beef supply with respec with respect to pork". On page 209, in Figure 7.14, the predicted price in October should be $0.80, not $0.08. The section "The Mathematics of International Market Equilibrium," found on pages 242-245, contains many innaccuracies. The method for calculating the equilibrium is incorrect. The correct version of this section can be downloaded here. For Word Format, click here. The correct version of Figure 8.17 can be downloaded here. For Power Point Format, click here. Page 256, second paragraph..."This may reflect a higher anticipated demand in April..."
Page 267, third paragraph..."A hedge is an instrument that loses you money when prices are favorable and makes you money when prices are unfavorable." Page 267, third paragraph..."She hedges by selling a corn futures contract..."
We are more than a bit embarrashed about this Chapter, as we described the second stage of production completely wrong. This file contains the corrected verbage, and this file has the corrected figures. 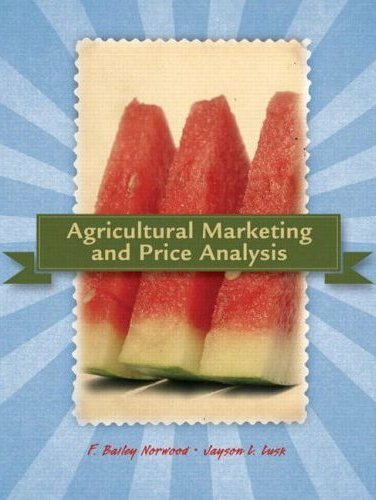 This pdf file is a workbook I use for my Introduction to Agricultural Economics class. Pages 105-192 contain a database of questions, where the page numbers of the textbook corresponding to the questions is shown at the top of each page.